SIGHTING!- the tiger was spotted crossing the road and entering the bush to the side of the road this easter weekend by 2 adults and 2 children, 40kms from Nannup on the Vasse Highway. Police have been notified and further action may be taken, as the tiger could be involved in some sort of illicit drug trade. It is believed that the capture of the tiger could lead to several more arrests among the local wildlife, this could be just the tip of the iceberg - who knows what the kangaroos really keep in their pouches?? Back to your regularly scheduled web page. 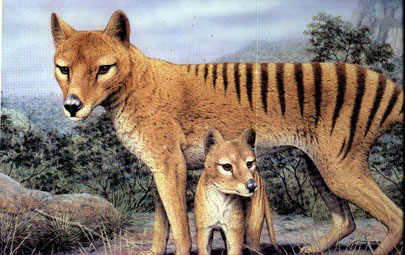 The Thylacine had the head of a wolf and the stripes of a tiger. A solitary creature, it tended to hunt only at dawn, dusk or night, lying up in its lair during the day. The Thylacine was the largest modern carnivorous marsupial until it was widely belived within scientific circles to be extinct by 1936. It was slaughtered with such zeal that there was little opportunity for scientific study and, as a result, very little is known about this animal. Despite its general resemblance to a wolf, the Thylacine had nowhere near the wolfs speed. It moved at a slow trot, occasionally breaking into a canter, and its method of hunting was to pursue its prey doggedly until it fell down exhausted, whereupon the Thylacine would pounce. The Tiger has been known to hunt down and attack small flocks of wandering sheep, in and around the Nannup area. It's favourite method of disposing of the victims is via the removal of the offending creatures neck. Not always are the victims eaten, the Tiger (like many of it's human adversaries) enjoys killing purely for the fun of it. The Thylacine was a solitary animal. Although it had no well-developed glands for scent marking, it is likely that it had its own territory, since it made little or no attempt to move from an area when hunted. Back to the Telecentre page.